I’m so excited to share that I won a free autographed copy of Brigid: History, Mystery, and Magick of the Celtic Goddess by Courtney Weber. A friend on Twitter brought the author and contest to my attention after I posted about my recent Imbolc reflections and activities. I decided to enter because why wouldn’t a flame keeper want to get her hands on a book about Brighid?! Plus, Inciting a Riot described it as such: “Think Eat, Pray, Love meets Mists of Avalon.” Um…yes please? I found it waiting for me yesterday and I hope to start reading it tonight. What a delightful Imbolc blessing! I’ll be sure to let you know what I think about it when I finish. If you’re too curious to wait, you can order a copy from Courtney’s website! My Twitter pal Lady Althaea really inspires me. Like other Pagans and Witches, much of her work focuses on keeping in touch with the land. She does a lot of foraging and herbalism, and I feel like I don’t get out as much to explore like I used to. Her posts on her blog and Twitter enchant me, and often inspire me to just seize the day and get outside. We recently had a discussion about wood sorrel that reminded me I not only had a recipe for wood sorrel soup I wanted to try, but I had a big clump of it growing in my pea pots. The pea plants were looking rather spent, so I took it as an opportunity to pull them, add more soil, rake it a bit, and plant more for the fall. I also pulled up tons of wood sorrel for my soup. The recipe comes from the book Edible Wild Plants: Wild Foods from Dirt to Plate by John Kallas. It’s a wonderful introduction into foraging, focusing on the easiest to identify and prepare. There are numerous photos to help you feel confident in your foraging. Best of all, many of the plants probably grow near your home, perhaps even sharing space with plants you are growing on purpose! 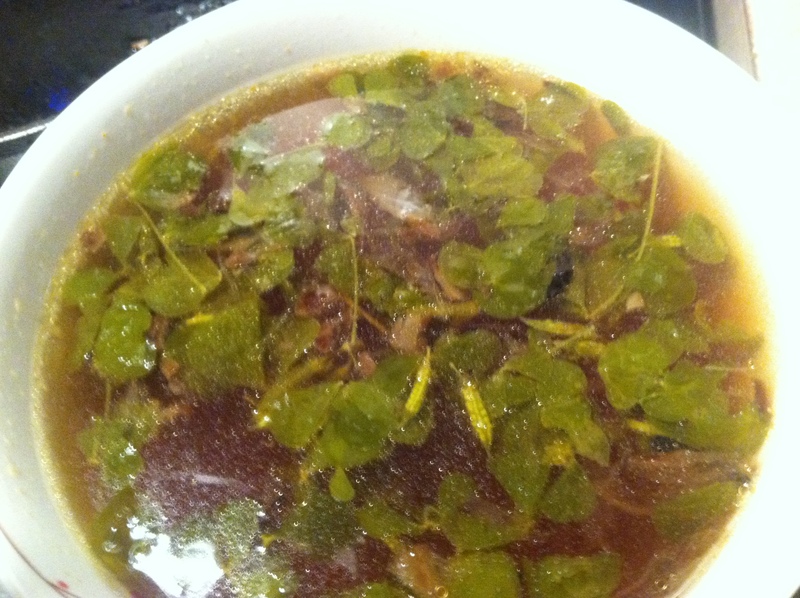 Wood sorrel soup. Photo by Grey Catsidhe, 2015. Other wonderful things are happening in my garden. The tomatoes are starting to ripen, I have some eggplant and even a zucchini on the way. A “surprise pumpkin” is taking shape – you know, the kind that grow out of jack-o-lantern guts! 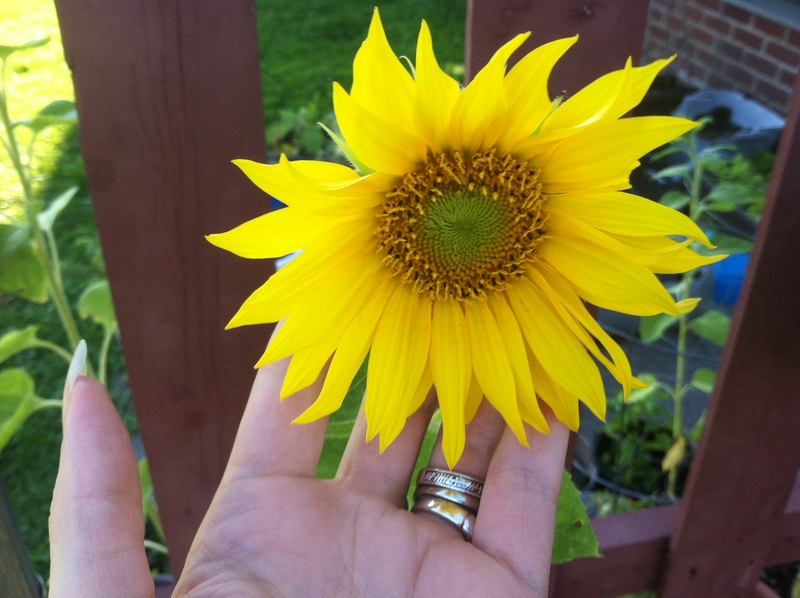 It makes me excited for Samhain… One of my favorite signs of August occurred recently – my sunflowers have opened! I will let them go to seed. I save some for more planting the following year, but I also use some as offerings over winter. I don’t normally reblog, but this post from John Beckett of “Under the Ancient Oaks: Musings of a Pagan, Druid, and Unitarian Universalist,” was just too good. A friend and grovie sent it to me because she felt I am a Druid warrior. That really made my day. I’m definitely not a passive tree-hugger. I do what I can to protect my tribe and the Earth Mother. The Dark Side of Druidry. What a cute (and kid-friendly!) project! I can envision folks making a new ghost each Samhain to represent a loved one who has passed away. It could also be a wonderful way to decorate an ancestral altar in October and November. DIY Finger-Knit Ghost Garland | Pretty Prudent.